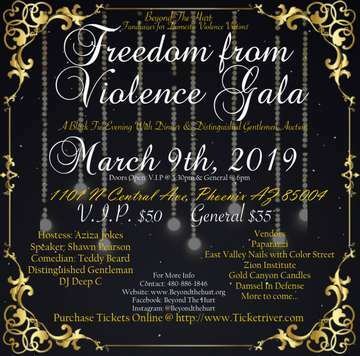 Beyond the Hurt presents “Freedom from Violence Gala.” Guest speakers from DV survivors, Vendors, Raffles, Distinguished Gentlemen Auction, Comedian, Dinner, and Musical performance. This event is to bring awareness to Domestic Violence. All proceeds goes to “Diva’s Safe House” for domestic violence victims. VIP: 1 free drink, Exclusive meet and greet with the Bachelors at 5:30, Gift, Front tables, and Male Servers for each table.